For the game released in Brazil, see Tennis Ace. 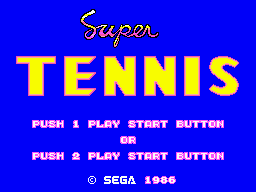 Super Tennis, known as Great Tennis (グレートテニス) in Japan, is a sports game developed and published by Sega for the Sega Master System. It was released on a Sega Card internationally, and also on a cartridge in Europe. Main article: Super Tennis/Magazine articles.